Home automation systems link electrical systems for remote control from a user interface panel, a computer or smart phone. Wireless control of a driveway gate offers automation convenience and security with users typically interfacing in close proximity with a gate control interface. Bluetooth interfaces are a good choice because they work well at short distance, are available in many smartphones and provide direct communication between user and gate control interface. Bluetooth key fobs can also be used in addition to smartphones. 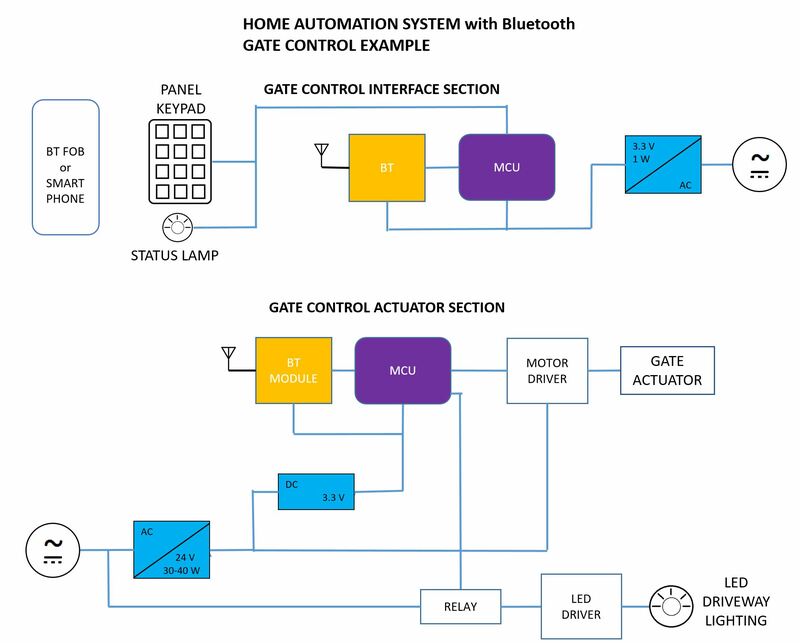 The gate control example shown uses Bluetooth communications and a microcontroller for authentication, manual keypad decoding and control of the gate actuator (typically based on a gear motor). In terms of powering this control unit, an AME40-24SCJZ (or AME40-24SMAZ) power module, rated 40 W, converts 100-240 VAC to low-voltage 24 VDC could be considered for the gear motor. An AMSRI1-783.3-NZ (or AMSRO1-783.3-NZ) converts 24 VDC to 3.3 VDC for communications and processing. Optionally, the Bluetooth and keypad activation unit could be packaged as a gate control interface and placed approximately one car length from the gate and its actuator unit; in this case, the gate control interface section will only need low power (as little as 1 W or less) and it could be sourced by an AME1-3.3SJZ (or AMEOF1-3.3SJZ or AME1-3.3SAZ) power module which converts 100-240 VAC to 3.3 VDC. The gate control interface unit can communicate with the gate actuator unit via a Bluetooth link. Gate controls are exposed to wide outdoor temperatures and need power converters that will reliably start at chilly winter temperatures and operate at hot summer temperatures. AME1-AZ, AME40-CJZ and AMSRI1-NZ (AMSRO1-NZ) are power modules designed for use in extended temperature conditions; they reliably start at temperatures as low as -40 °C and can work at temperatures above 50 °C. AME1-3.3SJZ power module which converts 100-240 VAC to 3.3 VDC and can work from -25°C up to +55°C (full power) can be used for indoor applications. FCC part 15 Subpart B, Class B, ANSI C63.4 :2003 *. Additionally, AME1-AZ, AME1-JZ and AME40-CJZ have CUL, CE and CB approvals which reduces end-product development time and facilitates end-product compliance across most world-wide locations. LED driveway lighting under gate control can be powered from AMER-Z LED drivers which are also rated for operation at extended temperatures.